At the start of this season, all-knowing college basketball statistician Ken Pomeroy announced that he’d be requiring a subscription fee to access his incredible database. While this was greatly disappointing to many a college basketball fan, we at Crazie Talk decided that this was as good a time of any to start doing some statistical analysis of our own, specifically focusing on Duke and Duke’s opponents. Using Basketball Reference, In-The-Game.org, and Pomeroy’s own resources, we decided to focus in on four different metrics – game score, effective field goal percentage, offensive rebounding percentage, and usage percentage. Let’s start with the game score, which is computed via the formula below. The game score is a basic efficiency rating, devised by NBA stats guru John Hollinger. It is designed to be applied to single games and is scaled relative to points scored. Scores above 20 are considered to be excellent, while scores below 10 are average. Four games into this season – only two Duke players have posted game scores above 20 – Seth Curry and Andre Dawkins, both against Michigan State. According to Dr. Oliver, effective field goal percentage is the most important factor contributing to whether a team will win a game. Obviously, a team that has a bevy of effective scorers will put themselves in the best possible situation to win. Thus far, Ryan Kelly leads the team in eFG% with a whopping 75.72% over four games. For a historical perspective, the Duke all-time leader in eFG% was Carlos Boozer, who posted a 63.1% over his three years in Durham. Last year, Andre Dawkins led the team with a 63.5% mark, which was one of the best in the nation. Offensive rebounding rate is a metric to measure how many extra possessions a team can convert from missed shots. Obviously, Duke fans understand the importance of offensive rebounding – as Brian Zoubek averaged a ridiculous 7.8 offensive rebounds per 40 minutes on the way to the 2010 National Championship. 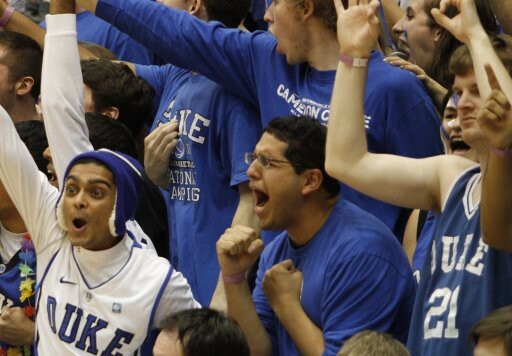 This was well documented during Duke’s 2010 run, as the Devils struggled to shoot well but consistently put points on the board and won games. Miles Plumlee currently leads the team in this category with a 21.19% mark. It will be interesting to see if Duke’s three headed monster of Miles, Mason, and Ryan Kelly can become a force on the offensive glass – if so, Duke will be very, very tough to beat. This figure should be especially interesting for Duke this year – with a superstar yet to emerge and a number of players who can dominate the ball on any given night. Personally, I’d expect Seth Curry and Austin Rivers to dominate in this category down the stretch, but the distribution has been relatively even for games up until this point. To provide a visual representation of the stats that we’ve tracked so far, we’ve put together a Motion Chart – which essentially allows you, the readers, to observe how each player has fared in each of these metrics over time. Each color represents a different opponent, and each bubble represents a different player. You can track an individual player’s progress – from Belmont to Davidson – or focus on a single game to see who on the team was most effective and in which areas. In its default setting, the motion chart projects game score against eFG% – providing a general idea of how well each player played during a given game. The size of the bubble is representative of a player’s usage percentage – thus allowing us to discern how big of an impact a certain player may or may not have had on any given night. Of course, these parameters can be changed. Feel free to play with the axes and project each of these metrics against one another – it is definitely interesting to look at the statistics and compare the numbers to our own observations of the actual games. We’ll be posting updates to the Motion Chart after every game, and after we have collected a sizeable amount of data, we will have a pretty interesting (and hopefully accurate) measure of how well this team is (and is capable of) playing. Obviously, the season has just begun, and so has our foray into statistical analysis. If you have any suggestions or ideas for different methods we should check out, feel free to comment here or tweet at us @crazietalker! We would love the feedback and want to make this as informative and awesome as possible. As always, stay Crazie! We’ll be live-blogging the game this afternoon, so be sure to check us out around 5pm! Go Duke!